Magic system overhaul - Spells become more powerful as your skill increases. You don\'t have to rely on gimmicks to play a mage anymore - choose a playstyle that suits your character! OPTIONAL: Balanced_Magic_Dawnguard.esp - scales the conjured boneman, mistman, and wrathman from Dawnguard. I've also attached an excel spreadsheet with data on specific numbers used. You may fill in the yellow boxes to see what sort of numbers to expect. *Note: If you have a previous version of this mod installed, be sure to uncheck it in your Data Files, and that only Balanced_Magic.esp is running! 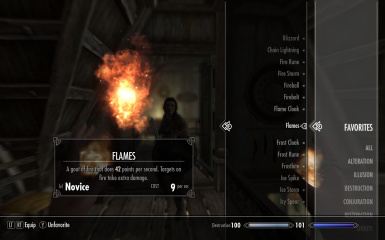 This mod is intended to provide greater flexibility when playing as a mage. Instead of relying on a few overpowered gimmicks, mages should be able to experiment with different techniques in different situations, and still have a reasonable chance of overcoming their opponent. I have attempted to make each school of magic uniquely powerful while staying pure to Elder Scrolls lore. - Spell costs have been calculated so that they no longer decrease as your skill improves; instead your spells will get more powerful as skill increases. - Neither light nor heavy armor increase spell costs, however, costs are reduced if armor is removed since movements are less restricted, making it easier to cast spells. Each slot (head, body, hands, and feet) that is unarmored will reduce casting cost by 8%. - The Novice, Apprentice, Adept, Expert, and Master Alteration perks increase the duration of corresponding level spells based on your skill. At skill level 100, duration will have doubled. - With scaling, higher level protection spells became redundant, so I have altered them so that each is the embodiment of a particular element. Stoneskin increases your armor (much as the original *flesh spells did), and Flameskin, Frostskin, and Stormskin provide less bonus armor, but also offer some resistance to the associated elemental damage. - Spell duration increases with skill (automatically). Spells may be a few seconds shorter initially, but will increase to 150% of vanilla duration by the time you max your skill. - Fixed "Storm Thrall" spell so that it actually summons a Storm Thrall instead of Storm Atronach. It is now a ritual spell as well. - To keep damage to magicka cost ratios balanced, I had to scale cost up along with the extra damage. I also reduced the cost of Adept, Expert, and Master spells more than the 25% stated. - The impact perk causes stagger to occur 25% of the time in apprentice spells, 50% of the time in adept spells, and 75% of the time in expert spells. - Wards charge more quickly and provide experience each time they successfully protect the caster. They are free to maintain but drain magicka when hit. - The shield effect from the wards (bonus armor) has been set to 40 for all 3 wards. This scales up as your Restoration skill increases so that at skill level 100, you will gain 80 armor. Thank you for checking out my mod! Feel free to leave comments, suggestions, or endorse this mod!